The new Manticore/Deathstrike kit from GW is another of the very nice kits for the Imperial Guard line. However, I have one complaint. You can only make one missile from the kit. 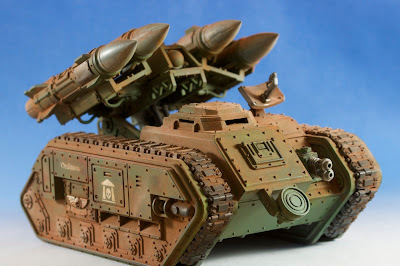 There is no way you can magnetize the missiles, ugh. But other than that, the Manticore kit is very slick. The front 'radio' dish needs to be completed, but the rest of the model is done. The only other thing I need to do is to find some scatter dice that actually role 'hit' so that my missiles are more accurate! Great work on the tank, the weather really does look awesome! The inability to switch from the Manticore to the Deathstrike and back was the one thing that disappointed me with this kit. Otherwise I think it's one of my favorites, especially considering how easy I found it to assemble. Hope you're doing well, see you in April! @Cheef- I like 'em durty! @JJ- Well, it depends. Am I playing with you or against you?!? :) The codex clearly says it can't fire on the first turn. The scenario says you get to fire before the first turn. I suggest having several rules lawyers on hand and a couple of nights to play the game. Ok, a little more serious- firing the gun requires a dice roll with modifiers of a '6+' . Since this is a special scenario, I'd say you get a dice roll for each tank and have fun. Though many will argue and I'd side with them that you simply can't do it pre-first turn. Though it would be fun though! @Fikster- thanks for the link! I had this assembled way before that post came out, but good know that someone figured it out all ready. 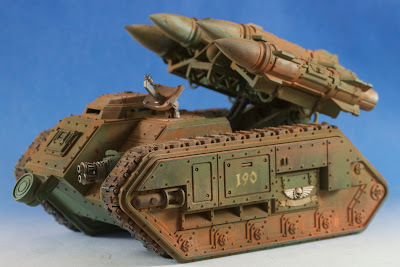 However, seeing how the Eagle Strike Missiles are not that great compared to the Manticore this addition, I don't think it will be that big of a deal to *only* have to use one version. However, I do need to buy another Manticore.... so you never know!